Nothing like Spring Break to throw off a blogging routine! Take a little R&R and the regiment of writing piffles away. The excellent part of R&R is the time to read instead of time spent grading essays. While I didn’t get down to business on my own writing as planned, I did get into quite a few great books. Here are the top picks for March. 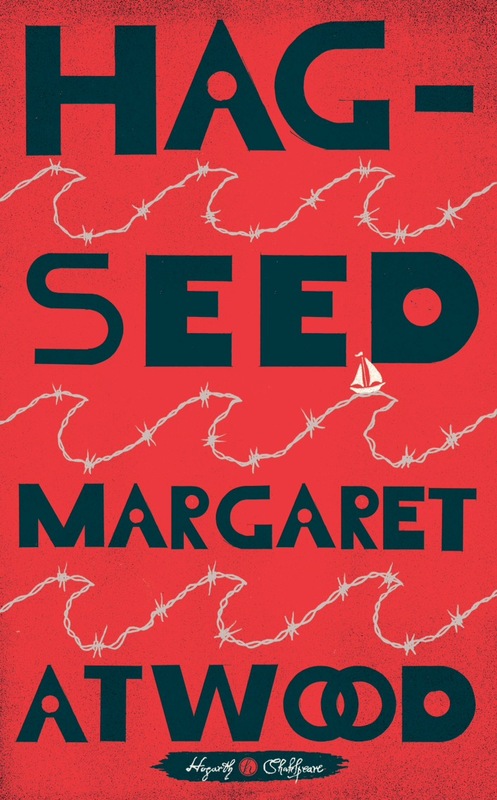 There is a slew of Shakespeare retellings out there, and my request for Margaret Atwood’s Hagseed, her version of The Tempest, finally came through at the library. The basic plot is Felix, a well-known director, whose overly creative approaches to theatre, is ousted by his protege. Seeking exile in a dilapidated farm house, our hero has a rough time of it until he takes a gig at a prison to bring Shakespeare to the inmates. While it was difficult to get into the story at first, Atwood’s version of The Tempest won me over once the inmates began acting out the play. Their fresh approach made The Tempest stand up and become more relevant to present day concerns. All the new revisionments of Shakespeare’s plays tend to be hit or miss in their approach. More misses than hits. Yet, Atwood, being the maestro of imaginative tales herself, gamely applied her own brand of magic to Prospero’s tale and conjured up an agreeable story within a play which plays upon the story. The best part of her adaptation was having Felix, the artsy, exiled director, explain the play to the inmates. Valuable education stuff. Should I ever choose to teach The Tempest I shall delve into Ms. Atwood’s classroom references. 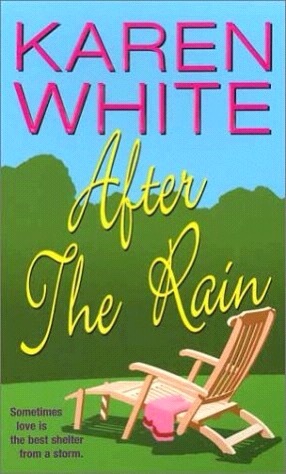 I’m not sure how this book got on my TBR list as I shy away from tragedy stories, especially ones about 9/11. And this story had yet another tragedy story woven throughout–the Triangle Shirtwaist fire of 1911. 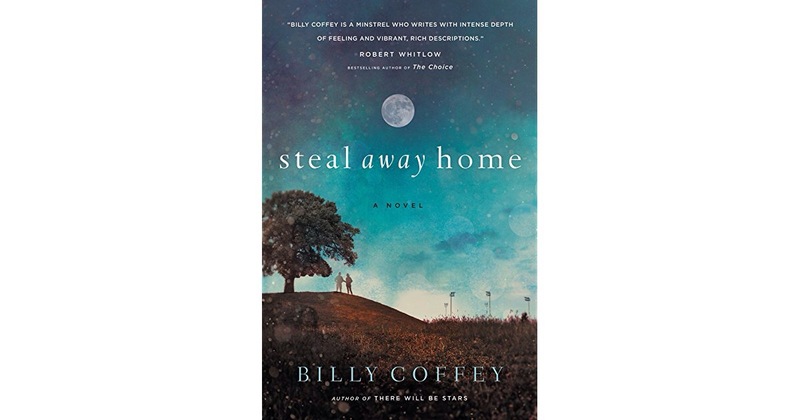 I got over my initial “read or not to read moment” and found myself involved in an amazing story that speaks well towards the gifts of grace, forgiveness, and redemption. 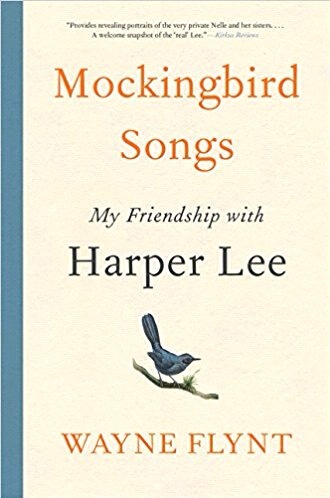 The parallel stories of lost love due to horrendous circumstances is skillfully and eloquently written. 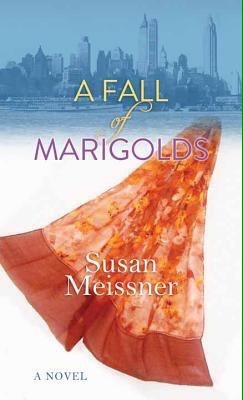 Susan Meissner infuses her stories with rich prose and an underlayment of faith that provides a richly satisfying read. The characters transcend their paper boundary and imprint. I looked forward to my reading time and spent most of one Saturday intrigued by Clara’s choices and Taryn’s painful healing. I cried. And laughed. It’s been a while since that’s happened with a book. My second book by Meissner. I’ve now loaded her other books on my TBR list. I can take a bit of tragedy in my reading when the story had such a powerful message attached. 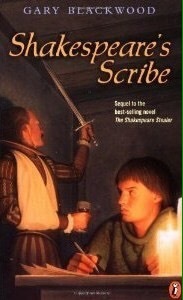 As a sequel to The Shakespeare Stealer, the story continues in following the historical fiction of Shakespeare’s acting troupe. While the action is not as lively as the first book, there is still plenty of intrigue as readers follow Widge’s determination to find his place as a player in the Chamberlin’s Men. The primary audience is middle readers or even young adult, yet I’m always game for a Shakespeare story. The black plague is a definite presence throughout the story and Blackwood’s attention to detail creates an engaging insightful look into the times of England’s Renaissance. Peggy O’Brian, director of education, of the Folger, queries how former Folgerians are doing from time to time. Seeing the Folger is neighbors with many prominent Washington DC power sources, such as the Supreme Court, her question holds some resonance of consideration. I paused and thought. How are we doing? The “we” for me being the school environment because school is a large part of my life and serves as a reflection of how the world out there is affecting the lives of present and future citizens: students. I will say this: there is unrest and concern. We are feeling the bite of unrest. Students are forming clubs that reflect their need to express their views. We have a club that celebrates the 50.5%, formed by young women (and young men). Another club is the League of Extraordinary Gentlemen, young men who want to explore what it means to be a male in today’s society. We also have Interact and Key Club, which reaches out with fundraisers to meet the needs of the community. The administration has a mentor class of student peers who lead discussion groups. Shakespeare is one way I illustrate how times of unrest are reflected through the arts. And it’s frightening to learn that funding for the arts is being threatened. I’m hoping our voices will be heard up on the Capitol’s hill that the arts are important and the people want them to remain a vibrant voice. We especially need our voices to be heard in times of unrest. The continuance of celebrating the 400 year passing of Shakespeare continues–I hope it just keeps continuing. 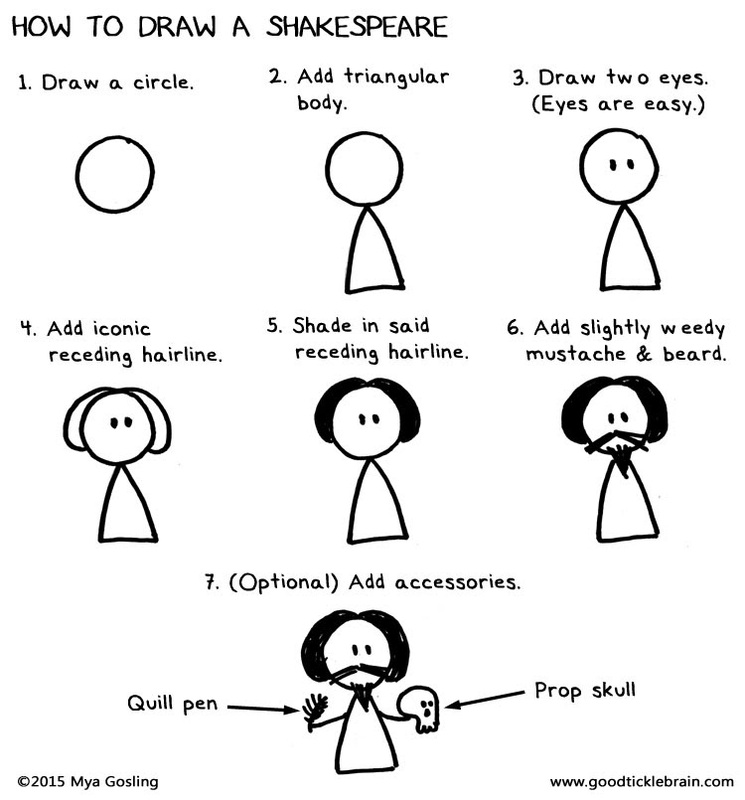 My mission this month is to convince high school students to join my Students for Shakespeare Club. I’m doing this not only because I want students to know the amazingness of Billy Bard, I’m also promoting the club because I don’t want to lose $400. You see many years ago a batch of drama students formed the Students for Shakespeare Club so they could perform the Scottish play at the town’s local theatre. It was a success. Money was generated from tickets, the students graduated, and the club somewhat languished until it became the starting point for sponsoring the yearly Shakesperience drama production. Long story short: it’s well known on campus how much I like Shakespeare, so it wasn’t too difficult to convince me to take on the task of scheduling the annual play. So what’s with the $400? Basically if a club does not use its funds it loses them–they get dispersed to other clubs. At least that’s what I understand. If I can get a few students dropping by my classroom now and then to learn Shakespeare stuff, like stage fighting, tossing out insults, arranging a flash mob, playing around with scenes, I think I’ll be safe. Here’s my promo for the morning announcements. It was a hit. It was a hit. As a thanks for playing, participants got Smarties for becoming smarter about the Bard. Candy is always a hit. I managed to sign up six students. I’m in business. Should I go for stage fighting for the first meeting? Or a (maybe not so politically charged) flash mob scene? Shocking. The tremors from the announcement that the Oregon Shakespeare Festival will be futzing with the Bard are rippling through out various literary communities. It’s one thing to sneak No Fear Shakespeare into the classroom when teaching Hamlet and company to students, it’s quite another to go to the theater and pay good money to hear modernity instead of Bardinator verse. If you haven’t heard the news, hear it here: Shakespeare is undergoing translation, and yes, I do believe something will be lost along the way. So says Dr. McWhorter who teaches linguistics, American studies, philosophy and music at Columbia University. Just because we haven’t kept up with Old English doesn’t mean it should be changed to meet our needs. There are plenty of analysis experts who have provided handy translations of Shakespeare’s works. We just need to take the time to read them. Or better yet, figure it out on our own. It’s called learning. What really concerns me is if this could be a trend towards other changes. Sophocles? That old dead writer of Mediterranean vintage who wrote about the son who inadvertently married his mother? Yeah, it’s Greek to me too–better change it up so we can understand his plays. Then there is Emily Dickinson. Dash it all, she really doesn’t understand how to properly use punctuation, better to get grammar check suggestions for her. She’s still in public domain, so she won’t mind. Honestly, if we quietly allow Shakespeare to be mucked about with and don’t fuss about how *presto chango* his beautiful verse and prose gets shazzamed into everyday slings and arrows, then we will surely watch all the old classics become literature lite. Less calories, less filling. 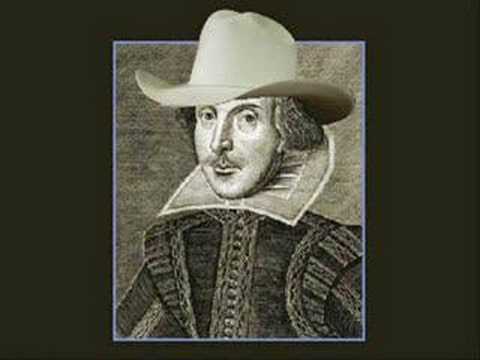 How do you feel about those Oregon Shakespeare folk messing about with Shakespeare? Me thinks it’s piteous to mess with the muse. image: morguefile/johninportland TRANSLATION: Roses are the prettiest flower out there. 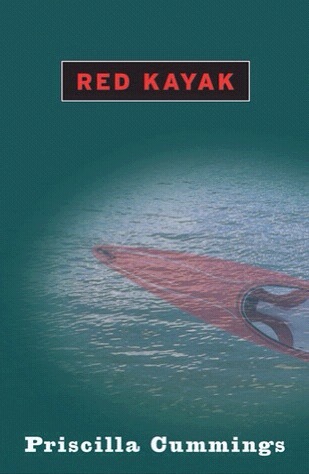 Nope, it just don’t float. Considering I had no exposure or any real knowledge of Shakespeare until I began teaching his works in high school, I’ve certainly made up for lost time. Bardinator /n./ a person who goes beyond face value knowledge of Shakespearean works and dives in to study, appreciate, and revel in the works of William Shakespeare to the point of total commitment. Simply put–a dedication to the Bard’s works beyond what is considered sufficiently normal. This summer I have reveled in more Bard than usual. It began, appropriately enough on July 4th* when I landed in Washington DC to study Hamlet for a week at the Folger Shakespeare Library. Twelfth Night starring Mark Rylance in the role of Olivia. Yes, finally. A Shakespearen production as it might have been presented because of the all male cast. The play was filmed at The Globe with a live audience (groundlings included) in sharp, glorious HD. Mark Rylance and his troupe superceded expectations. It was unprecedented theater. I will have problems readjusting to women playing women now in Bard dramas because Shakespeare wrote the parts knowing men/boys would be playing women. Or in the case of Viola/Caesario-, a youth playing a woman disguised as a youth. The lines and meaning take on a whole new dimension with the knowledge it’s two men playing they are attracted to each other but the manly man doesn’t want to admit to it . But thr audience knows the fair youth is really supposed to be a woman since it’s a boy playing a woman dressed as a boy. The confusion is intentional, as is the jovial mistaken engendered double meanings. To round out the summer I watched my first ever Shakespeare in the Park or more precisely, on the grass at the local fairgrounds. A group of thespians out of Montana traversing five states presenting either Cyrano or Taming of the Shrew graced our fare (or fair) town. And what a turn out. Beginning at three o’clock people arrived to claim their patch of grass and browsed the various booths ranging from spun wool goods to sword play. A lively Renaissance trio added appropriate musical ambiance. At six o’clock the western-themed show begun and the audience whistled and hooted out their appreciation at all the puns and ribaldry. The best bit was unplanned when a wee little lass wandered onto the stage at just the moment when Petruchio instructs Kate to speak to the “maiden” (Vincentio). Not missing a beat, Vincentio grabs up the sweet interloper and announces: “This is my granddaughter” and managed to return her to an embarrassed audience mother. A truly fun community event to commemorate the closing of summer. 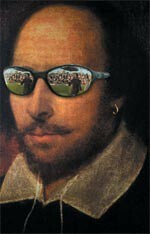 Soon I will be bringing Shakespeare to the classroom, but perhaps we’ll Bard out on the lawn. BOOC–bring our own chairs. Did anyone else have a bit of Bard along with their beach and BBQ days this summer? *yes, there is a connection of studying Shakespeare during America’s independence week–Wm. Sh. became our nation’s first playwright when his plays sailed over from England. In fact, the Folger has the first Elizabethean stage. A regular Tudor de force (upon which I played a hammy Horatio). *I just spent an hour hopscotching about the Net trying to find that nifty definition I stumbled across years ago. No luck. 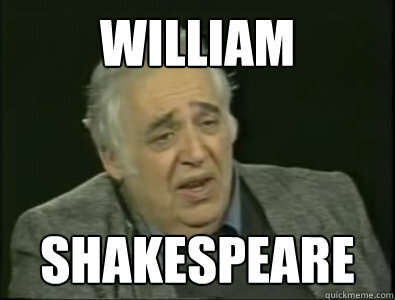 I did find a new blog concerning Shakespeare. I have created my own definition. This will be a work in progress and I am quite open to other interpretations. 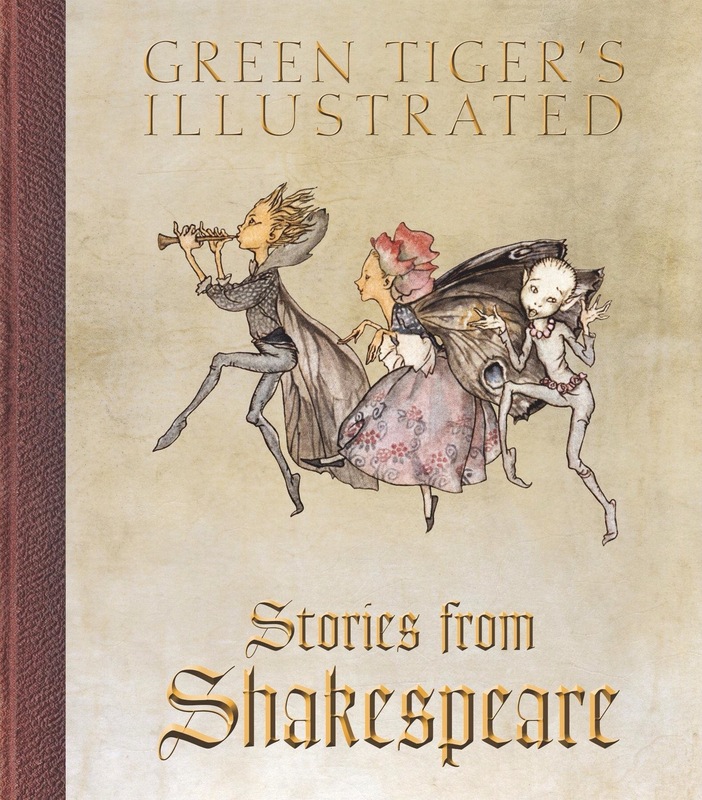 Bloom creates a portrait of Shakespeare through the observations of others including Samuel Johnson and Ralph Waldo Emerson. Considering this volume is under 200 pages, it’s packed with vital insights, including a chronology, works list, and a bibliography, to set me off along the trail in my search for Shakespeare. I look forward to my discovering of William Shakespeare, and I hope you won’t become bored with my Bardinating over the course of the year.